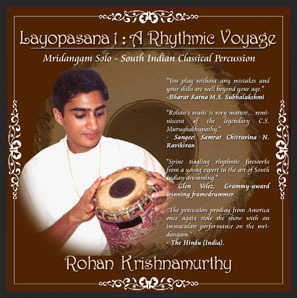 Buy Now: Rohan Krishnamurthy’s Layopasana percussion album series. Recorded in a single take, the solo is an original composition specially set in the traditional Carnatic rhythmic framework of 2 kalai Adi Tala, a rhythmic beat cycle with 16 repeating units. The piece features a wide variety of rhythmic intricacies, including advanced elaborations in subdivisions of 3, 4, 5, 7 and 9, as well as the stunning tonal capabilities of the mridangam. The blend of the rich percussive styles of a host of Indian drums like the tabla, tavil, and khanjira, as well as the techniques of legendary Indian percussionists, creates a refreshing and inimitable style on the mridangam. In this original production, Rohan Krishnamurthy and Ryan Andrews unite the sophisticated percussive tradition of Southern India, the driving rhythms of West Africa, and the exciting and ever-changing spirit of jazz percussion. Featuring vibrant solo performances and dynamic interplay on a variety of instruments, Rhythmic Explorations is set to the South Indian 8-beat time cycle of Adi Tala and at once ties together and extends the boundaries of these three remarkable percussive traditions. The third album in the Layopasana series features seven instructional solos for mridangam, the ancient South Indian Classical Carnatic double-sided hand drum. Set against the meditative electronic tambura drone backdrop and the bright jalra finger cymbals that aurally enhance the time signatures, these creative solos highlight many of the essential techniques and patterns of the mridangam. Useful for students of all levels, the solos uniquely blend the major percussive styles of South India with the innovative artistry of Rohan Krishnamurthy.